Archive of posts tagged with "humor"
Why do I deserve this? Probably for, at various points in the last several years, linking to the two transformative takes on Jeff Goldblum I embed for your convenience below. You can thank me later, if you haven’t already. That last one is still criminally underwatched, so I don’t mind sharing it here again. Do keep me abreast, all you crazy uncles out there! There’s been a lot of news in the past week about the legal kerfuffle between the Beastie Boys and a company called GoldieBlox, which markets science/engineering toys aimed at girls (and their parents) seeking something beyond the standard pink princess fare. So, I was as surprised as anyone to learn about the legal battle currently underway over this parody of a parody (if, in the initial instance, an ambiguous one). Obviously, GoldieBlox’s “Girls” is derived from the Beasties’ “Girls,” but it’s a complete re-recording, marshaling certain familiar elements — the riff, the refrain, and certain text/melodic lines — not all unlike the ways the Beasties themselves cribbed and borrowed and reassembled their own song out of prior performances. What should we make of the Beastie Boys taking two songs deeply inspired by African-American religious ritual — the ring-shout in the case of the Isleys, and Diddley’s hand-clapping & foot-stomping “communion service” — in order to make a rearguard, if possibly parodic, song about women? On what grounds should the Beasties be allowed the privilege of doing something so derivative/transformative, while GoldieBlox should not? make no mistake, your video is an advertisement that is designed to sell a product, and long ago, we made a conscious decision not to permit our music and/or name to be used in product ads. This is especially poignant given that Adam Yauch (aka MCA) made this same wish explicit in his will. But then, GoldieBlox isn’t actually using the Beasties’ music. Or are they? It’s a question — and not an easy one to resolve. (For any of us, or for a judge or jury for that matter.) They’re certainly not using the Beasties’ recording, or even a sample from it. Why should we determine that the Beasties’ should be able to stop others from re-assembling the same pieces that they themselves assembled without licensing/permission in the first place? Should GoldieBlox respect the Beasties’ wishes? What about, say, James Newton’s wishes? An avant-jazz flutist, Newton famously insisted that the Beasties’ use of a sample of his flute performance on “Choir” for the Beasties’ “Pass the Mic” constituted copyright infringement, but a court ruled that the snippet was too short to constitute a part of his composition, and since the Boys had licensed the recording from Newton’s record label (for a paltry $1000), they were allowed to go ahead and use it despite lacking Newton’s permission. When did “Girls” escape the Beasties’ creative control? Perhaps as soon as it was commercially released and massively distributed. In its own way, the Beastie’s “Girls” was, in the first instance, itself an advertisement — an ad for an album, an ad for concerts, an ad for a sophomoric act that the Beastie Boys took to the world and to the bank. All that said, it’s still a little odd for the likes of the EFF to step into the fray, and to argue for fair use simply because they agree with Glodieblox’s putative politics. Clearly, commercial instances of parodic fair use have been upheld before — s/o Luther Campbell & Henry Louis Gates — but it’s always a matter of convincing some judge/jury about the lines people want to draw around musical ownership. Toward that end, I think considering the big musical picture here helps. I mean, just imagine the chilling effect on other renditions of “Girls”! In a world of personal branding, where do we draw the line between commercial and non? Between advertisement and not? For my part, as a dad, I’ll be sure to teach my daughters how to reverse engineer our favorite Beastie songs as soon as the girls are ready for some serious digital music trickery. Africa Is a Country, a wry but passionate blog devoted to “Africa” — the idea, not (simply) the song — in contemporary media (but “not about famine, Bono, or Barack Obama”) has been threatening to make a weekly series out of the genuinely remarkable resonance of Toto’s 1982 soft-rock anthem. It’s a begrudging tribute of sorts to the song’s “resilience as a piece of media about Africa.” Did you know that in addition to dozens of covers, which they promise to feature, the song is also popular sampling fodder for hip-hop producers (among them, Madlib)? It promises to be entertaining, whether or not you can withstand the earworm. This week they pointed to a new appearance of what they’re calling “the Toto ‘Africa’ meme” courtesy of r&b crooner Jason Derulo, which, I have to admit is both “inane” as they note over there and a pallid by-the-numbers attempt to reproduce the feel and form of “Watcha Say,” his debut single and highest charting song (it hit #1). I can’t help but be reminded of a strange and oddly apropos discovery about Toto’s “Africa” I made a few years ago, which may be of passing interest to some of you, especially fellow followers of Africasacountry. Here’s how it happened: my dear friend and colleague, Sharon, is a doctoral student in anthropology who studies the transmission of traditional Malian dance, especially in transnational contexts. A longtime trad-African dancer herself, she has studied and danced in Mali, the US, and France. Anyway, long story semi-short, when Sharon was getting hitched a few years back she asked me whether I might help her arrange some music for her reception (an awesome & lively affair, full of drums and dance, in which a young & chubby Nico got to prance about with the august & strikingly spry Dr. J. Lorand Matory). I have to confess that I’ve found it rather challenging to think up other songs that employ the same rhythm(s) as Didadi (aside from the tight fit that is “Gettin Jiggy Wit It”). Been racking my musical memory, which has led to some false leads and close fits, but nothing else — until this afternoon — save for a funny refrain from a Cypress Hill song (“la la la la la la la la” in “Hand on the Pump”). Funny enough — actually I think you may find this discovery fascinating — as I was trying once more this afternoon to think of other songs that might match (and I’m being fairly exacting in wanting a good match — a direct rhythmic overlay), I started humming the rhythm to myself: buh-duh-duh-duhduh-duh-duh. Eventually a vaguely familiar bassline / chord progression emerged from my murky brain. I couldn’t place it, though, and couldn’t remember any words, so I just sang along with the melody until I reached the chorus, where, I hoped, I might remember a single Googlable word. When I got there, I was stunned: the word was “Africa” and the song, natch, “Africa” by Toto! What a hilarious coincidence! I have no idea whether the group was intentionally figuring Africa with that rhythm — it’s never sounded very African to me, but it sure does now! Anyhow, I’m afraid that means I have only turned up 3 songs that use the same rhythm(s) as Didadi. And two of them are quite cheesy. But this is all in good fun, right? Anyhow, see attached and tell me what you think. For now, I’ve chosen to leave Joh’s performance unedited, so you hear the entire ~2:00 rendition that he gave us, the full arc, including all his variations and the general accretionary/crescendoing dynamic. If that works for you, that’s cool. If not, we can do some editing. Just let me know what you think. It’s easy enough to loop any of the measures he plays or to cut something here or add something there. I could extend any of the songs mashed with the drums, or shorten them, or change their order. I could also change the tempo so that it is faster or slower or gets faster over time (Jo does gradually get faster, and that’s one change I’ve made: now he stays at the same tempo, which helped me to mash/match things up). … a white boy is trying to write a song on Africa, but since he’s never been there, he can only tell what he’s seen on TV or remembers in the past. I hear the drums echoing. Do you? Musical Encounters of the Fifth Kind? NASA’s announcement in December about our impending arsenic-based overlords caused quite a stir, followed by a fair amount of disappointment. Despite oddly worded reports suggesting that “NASA has discovered a completely new life form that doesn’t share the biological building blocks of anything currently living on planet Earth” (his emphasis), it turned out that NASA scientists had not encountered an actual extraterrestrial lifeform, only that they had (allegedly) “discovered” — more like, tricked into being — a form of life that departed enough from conventional understandings (by processing arsenic in place of phosphorous) that it is practically alien, and as such has implications for the study of extraterrestrial life: namely, that we need not expect life from elsewhere in the universe to look quite like it does here. Of course, tantalizing as it may have seemed, NASA’s press release was also, in retrospect, fairly dry and careful, promising no more than “an astrobiology finding that will impact the search for evidence of extraterrestrial life.” But for those who nonetheless had fantasized about a closer kind of encounter, do I have news for you. Better than news, actually: remixes. Put aside for a moment your suspicion that aliens might be sending us interstellar 419 scams. Why not audio edits? We did, after all, launch a big ol’ golden phonograph into space some 33 years ago. 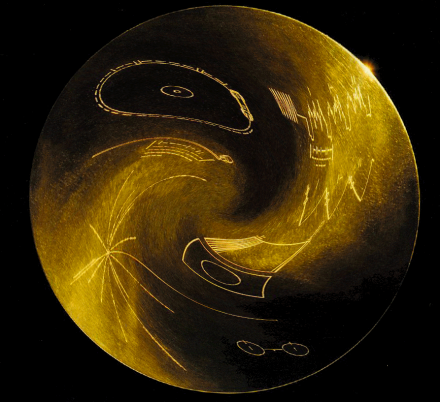 What if the Voyager record found its ways to alien “ears” (or intelligences, anyway) after all? What if the response was to scramble and reassemble our own sound and syntax and to send it back earthwards? And why not send remixes with a cosmic twist of the critical dagger? In 1977, NASA launched the Voyager 1 & 2 spacecraft, fastening to each a phonograph album containing sounds and music of Earth. If the best calculations are to be believed, one of these records was intercepted and “remixed” sometime in 2005 by extraterrestrial intelligences on the edge of our solar system. The Search for Extraterrestrial Intelligence in Exile (SETI-X), a dissident offshoot of the better-known Search for Extraterrestrial Intelligence, in 2010 finished decoding signals believed to be transmissions of these “remixes.” Scrambles of Earth, unauthorized by a skeptical SETI, is SETI-X’s document of these audio signs of possible alien intelligence. It could also be that the aliens were unmoved by Voyager’s musical program and sought in their version to reprimand Earthlings with an obnoxious response to what Sagan and others modestly termed, in the title of the explanatory coffee-table book, Murmurs of Earth. Even through the translatory medium of all-too-human audio algorithms, however, it is apparent that the aliens are playing fast and loose with complex intercultural questions and flirting with copyright violation on an interstellar scale. Here, the aliens have worked with classically ethnomusicological recordings of two fourth world peoples, the Navajo and the Yoingu residents of Milingimbi, Australia. The resulting fusion of a Diné night chant with “Devil Bird” may at first hearing remind the listener of “world music” fusions, though unlike most of those efforts, here the indigenous voices are not snipped into small bits/beats. Rather, it is the chordal composition of a member of the first Viennese school, Mozart, that has been so treated. This interpretation depends, it must be said, on imagining that aliens parse figure and ground in ways similar to the purveyors of worldbeat music, whom, evidence suggests, they loathe. The people at SETI-X are looking out for additional transmissions and transpositions. Let’s just hope, if any come in, they don’t start sounding too phishy. PS — I’m pleased to report that representatives from SETI-X will be joining us TONIGHT at Enormous Room for a special Beat Research session. To help celebrate their stunning discovery, Flack and I have invited some local friends to dig through the cosmic bins of their record collections and unearth all their deep space footage. So in addition to the SETI-X reps, Tim of A Stack of Dusty Records, the co-owner of Mystery Train Records in Gloucester, MA, will offer some thematic accompaniment, VJ Dziga will mix’n’mash rare NASA footage and other alien sights on the big screen while TDOGG explores further levels of photon manipulation. It’s gonna be out of this world! I mean, could it really be a mere coincidence that Yankee raps, “En la pista nos llaman los matadores”? At any rate, whether or not a suggestion simply planted in my own head (and now yours? ), I wanted to explore the strange overlap between arguably the biggest Spanish song of the last decade and one of the biggest Spanish songs of all time. So I went to YouTube and rounded up a baker’s dozen “España Cañi” instantiations. I like how the search itself, and the video below, help to highlight the amazing array of contexts for which “España Cañi” provides a model and soundtrack: from classical guitar etude to lounge piano standard, bullfights to ballgames to ballroom dances, baroque visions of Gypsy Spain to trippy scenes of liberated bulls and beefcake matadors jamming at Charo’s club, Pascual Marquina Narro’s composition sure seems alive and well — and often weird. Gasodoble from wayneandwax on Vimeo.